Teachers at the Agri-Horticultural School, Aurangabad, Deccan 1908 and Lahore town planning photograph 1928 [By kind permission of the CUL's Digital Library Collection]. 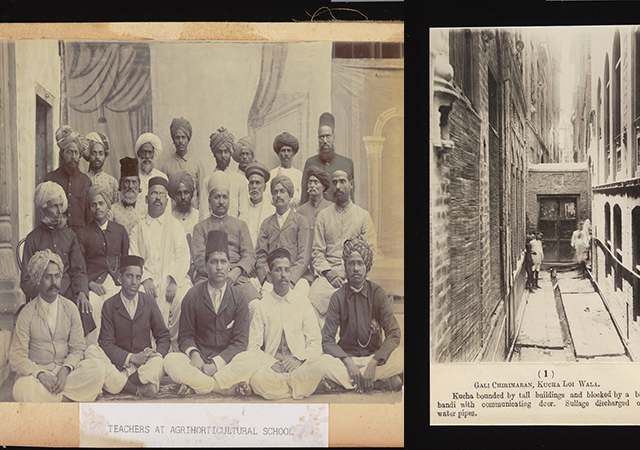 The latest release of photographs published on Cambridge Digital Library by the Royal Commonwealth Society department includes a large selection of historic prints of India, digitised with the generous support of the Smuts Memorial Fund. The photographs date from the 1860s to the late 1920s, and offer a diverse range of scenes and subjects, taken both by accomplished professional photographers and talented amateurs. The largest album was compiled by the distinguished medical officer, zoologist and explorer, Cuthbert Christie (1863-1932). Much of Christie’s career was spent in Africa, combating sleeping sickness and collecting zoological specimens for the British Museum and Museum of the Belgian Congo. Between 1899 and 1901, he worked for the Indian Medical Service as a Special Medical Officer for Plague in Bombay, and also held posts in Ahmednagar and Satara. Christy’s photographs document his medical duties and his travels throughout India. The RCS also holds two diaries he kept during this period, which when read alongside the photographs, shed much fascinating light on his experience of the subcontinent. Those interested in the history of India’s railways will be thrilled to view an album likely compiled by F.A. Hawkes, who was an engineer with the North Bengal State Railway from 1871 to 1879. The album also includes images of the Great Indian Peninsula Railway from the late 1860s, suggesting that he worked for it before joining the NBSR. It contains a mixture of photographs recording the construction, operation and staff of the railways, and Hawkes’ family, recreation and travel. There is also a photograph of Sir Richard Temple’s camp at the Delhi Durbar of 1877, when Queen Victoria was proclaimed Empress of India. Another highlight is an album from the Agri-Horticultural School, Aurangabad, which will appeal to researchers in botany and agriculture. It is the work of the photographer K.B. Phadye and illustrates the teachers, students and training carried out by the school. The album may have been commissioned to commemorate the visit in 1908 of the Prime Minister of Hyderabad, Maharaja Sir Kishen Pershadral, who appears in several of the photographs. Other digitised collections include photographs of Bombay in the 1890s, with some very striking views of the dockyards and harbour. Finally, but too large to be viewed here, are two panoramas of Ootacamund [Udagamandalam] by the photographer Albert Thomas Watson Penn (1849-1924). Penn was based there from approximately 1875 to 1913. The first panorama dates from the 1870s, and the second was taken in 1905, emphasising the considerable expansion of the town during these years. John Cardwell is the Archivist with the Royal Commonwealth Society Library collections at Cambridge University Library and researches, catalogues and promotes knowledge and appreciation of the collections.